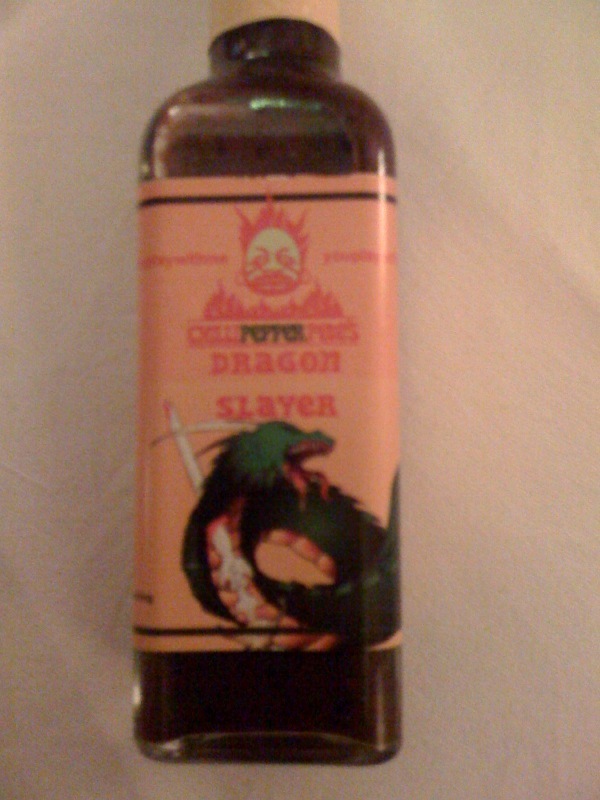 This little beauty, called Chilli Pepper Pete’s Dragon Slayer (chillipepperpete.com) is courtesy of Adam in Belushis (belushis.com) who passed this onto GCC after picking it up at the Brighton’s Fiery Foods Chilli Festival, which forms part of the Spring Harvest Festival (brightonspringharvest.com) from 11-21 March. It’s said to be the hottest thing they had there and wasn’t even put out in case the kiddies dipped their little fingers into it. GCC middle-aged kiddies are less concerned and (most) had a little dip before the most recent meeting. ‘Bloody hot’, ‘I can’t feel my tongue’ etc were comments, although to be fair the tingling does wear off after 15 minutes. The chef in the Mountain View restaurant in Blackheath declared this was something that’s used in Chinese coooking (like black bean sauce) not Indian. Although that didn’t stop us having a few more tastes at the table. Ingredients: blueberry, vinegar, Bith Jolokia, prunes, crystalized ginger, cherries, green tabasco, black treacle, 12mshu chilli extract, 15 MSU chilli crystal. Now you know.